Matching type questions have arrived! ClassMarker offers a variety of question types to assist with creating your online exams, such as multiple choice, multiple response, true/false, free text (short answer), punctuation (grammar) and essay (long answer), and our newest addition - matching questions. With ClassMarker's online Quiz Tool, we have implemented our matching questions to enable you to not only add text, but to also embed images and multimedia, such as audio and video, to both the left and right sides of the match. This provides the flexibility to be even more inventive when creating matching question types in online quizzes. With matching type questions, your test-takers will easily be able to select their matches from the drop-downs. For your convenience, the question text field is pre-filled with the text "Match the options below". You can, of course, change this to anything you like! When entering matches, choose to add different answer options for each match or choose from matches you have already created. ClassMarker's Quiz Maker with matching questions can also do the shuffle! 3. Shuffle Clues and Matches. 1. Assign a point value per question. 2. Assign a different point value per each match in a question. 3. When selecting to assign the same point value per each match in a question, set all points at once instead of having to make each match one at a time. Just as with all of our question types (except essay which are graded manually and automatically recalculated), matching questions are graded automatically providing instant graded results for users to review on-screen or using ClassMarker's Quiz Maker email results feature, you can have the results sent with only what you choose to display. 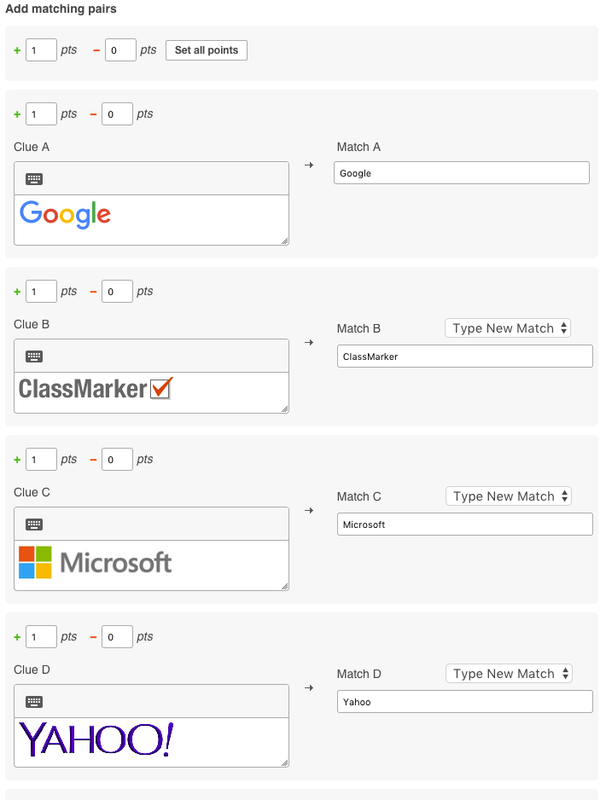 To view all of the possibilities that our matching question template offers, try out ClassMarker's online matching Quiz Maker today and see for yourself why we are the number 1 choice for Businesses and Educators worldwide, since 2006. Register Here to begin your 30 day trial with all features included. No credit card required. No strings attached. And did we mention that we never remove your data. Begin creating your customized Tests today with the peace of mind that all of your important data is safe and secure with ClassMarker. How do I Pull Questions from a Question Pool? How do I Create Online Exams? How can I Brand my Quizzes?